It's that time of year again! The malls are packed. Discounts are everywhere. People are looking for opportunities to volunteer or donate to charity. Advertising and marketing promotions are jam-packed with colorful lights and holiday ditties. That means by now, you should have your own business' holiday campaign all ready and raring to go, especially if you want to stand out from all the other companies doing that exact same thing. And there are some companies that are doing this whole "standing out" thing particularly well with their holiday marketing campaigns. This post will highlight 8 of the very best holiday-themed campaigns this year. I hope they either inspire your own marketing, or at least make your heart swell with the warm and fuzzies! 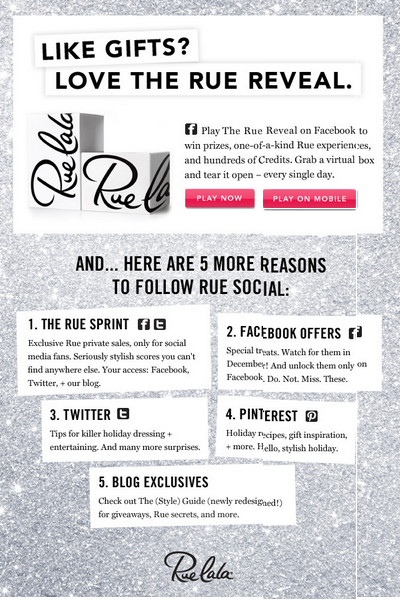 Rue La La is an online store with discounted prices on luxury products. Sounds perfect for the holidays already, right? Well this year, they upped their already awesome game by using social media, mobile marketing, and gamification. And glitter. In addition to their extensive social media campaign, they also give you the opportunity to play their addicting little game on your mobile device. The game? Every day, you get to OPEN PRESENTS! In the company's first ever holiday campaign -- that's right we've got a newbie on this list -- Zynga is allowing people playing their games to purchase in-app goods to benefit the charity Toys for Tots. So if you're playing popular games such as CityVille, Words With Friends, Draw Something, or Farmville, you can purchase a toy when you're in the game to donate to charity. 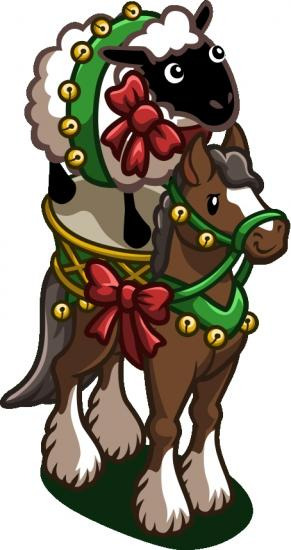 For instance, here's their "cheer-ewe-up horse" people can purchase for $1 in exchange for a little FarmVille farm decorations. Zynga has already generated $13 million in donations through 2.5 million in-game purchases. They took something they know they are good at, gamification, and are not only promoting their company's games but contributing to a great cause ... like buying games for kids! How incredibly appropriate. When creating your holiday campaigns, think about what you know about your audience and their habits, just like Zynga did here, so your audience will be more responsive. 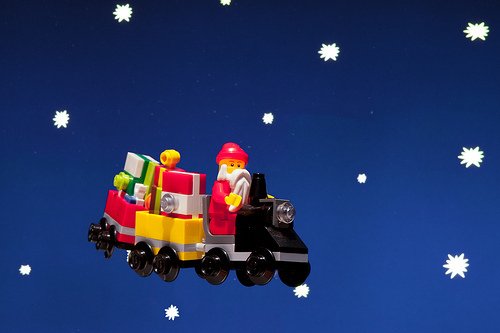 Who says B2B companies can't have holiday campaigns? Norton sells software to prevent and remove computer viruses. To celebrate Thanksgiving and kick off the holiday season, they created a funny video for the holidays. Take a look. Theres a couple things I like about this video. First, please notice that they've created a memorable and trackable URL for this campaign, norton.com/turkey, that redirects to a page about online backup. Good stuff, guys! But I also like the sentiment behind this campaign. Most people can relate to that woman ... feeling insanely frazzled this time of year, and kind of losing perspective on the "stuff that matters." The scenario ties in perfectly with the video's scenario, what Norton does, their video's tagline, and something we all could stand to remember this time of year: Protect the stuff that matters. Gilt Groupe is a luxury shopping website for women, selling retail items for up to 60% off the regular price. This season, they are partnering with nonprofit RED to reach a younger generation who uses their mobile devices for almost everything. 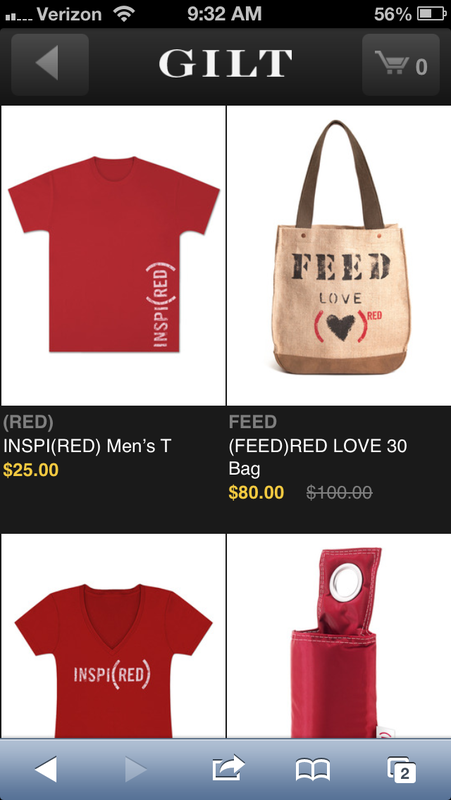 To donate to RED, users have to dial **RED, and they will automatically receive a text message with several links including a link to gilt.com's online store where they can purchase red t-shirts, bags, watches, phone cases, and other red items in support of the charity. Gilt has a large online audience, and by partnership with a charity in a mobile-centric way, they're able to reach that growing audience, provide discounts as expected by their fans, and donate to a charitable cause. Triple-threat holiday campaign! If you can take advantage of mobile during the holidays, definitely do it. Normally shoppers are on their phones non-stop, but during the holidays, it reaches monumental heights of activity. 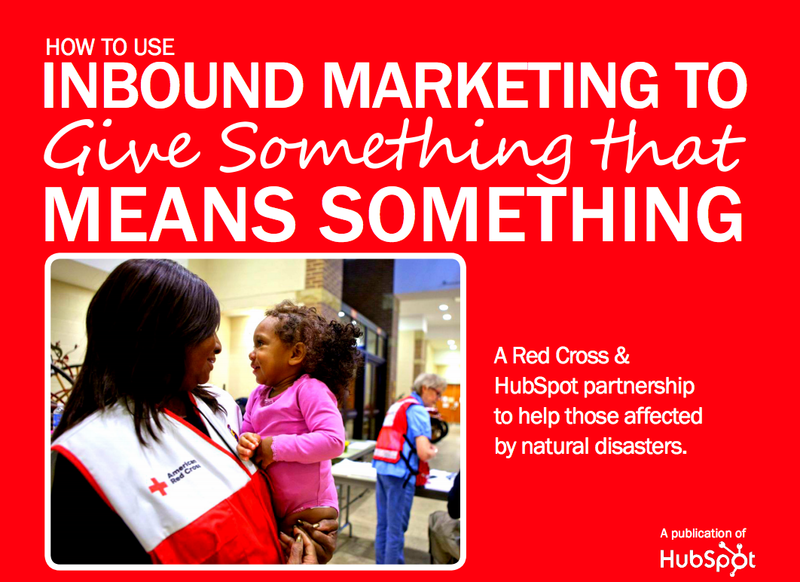 Red Cross has launched their annual campaign, "Give Something That Means Something." The purpose of the campaign is to make donations, well, meaningful. So instead of donating money -- always welcome, of course -- donations are in the form of more tangible items like blankets, shelter, vaccinations, etc. They produce a digital holiday catalog with all of the choices of what people can buy. The Red Cross has found that people are more excited to give something that "means something" instead of the more traditional gift of money. But it's not just the sentiment behind the campaign that we love. We actually wrote a case study (form-free, download your little hearts out) about how they're using inbound marketing to promote their campaign, too! Almost every holiday season, you can count on Coca-Cola to totally nail their holiday campaigns. This year, they hired Garyson Sanders, Lauriana Mae, and Jono to produce a song about friends spending the holidays together. To promote the campaign, they produced a series of videos and images that they promote across all of their social channels. Regardless of how you feel about the particular song (or the giant Santa), this is a great example of a coordinated social campaign ... and it's kind of meta, since the video is kind of about working coordination. I mean, you better be able to work together if you're moving a Santa puppet that big. When Coca-Cola promotes the campaign on their website, they have links to their Twitter, Flickr, Google+, Facebook, and YouTube accounts, and they use consistent tone and messaging that aligns with all their other campaigns throughout the year. And the bonus? Every year, they use music to promote their campaign, and use the song's sales to raise money for the Special Olympics. Cisco is a company that designs, manufactures, and sells networking equipment. This year, they created a holiday campaign called "How Do You Give Back?" promoted on their Facebook page. Every time someone comments on their Facebook page and tells them how they plan on giving back to the community, four meals are donated to the World Food Programme. The page also promotes other people who are giving back to the community. Though most people aren't making a natural leap from Cisco to Santa, they take the opportunity to show that they want to do something philanthropic during the holidays. At the same time, they're improving their social strategy by encouraging engagement and followers. 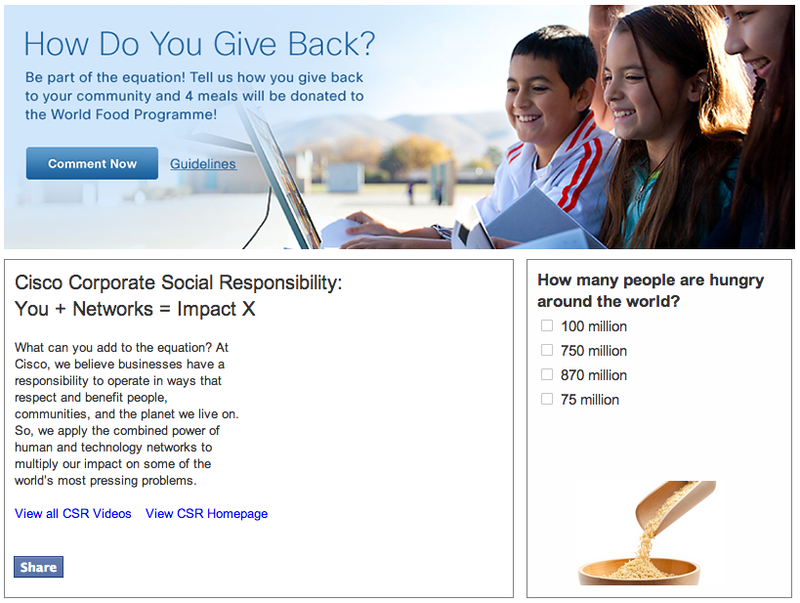 Customers want to see that companies are doing something for good causes during the holidays, and by asking them to post on Cisco's wall about the charitable things they're doing, everybody wins: Cisco's social media presence improves, followers feel good about their charitable work, and the World Food Programme receives meal donations. FedEx created a series of videos that made fun of people for things like waiting overnight in line on Black Friday, buying gifts at the last minute, and the expectation that Santa is going to be in every store. In addition to delivering a chuckle, these videos are quick, to the point, speak to a pain point common to many people this time of year, and remind everyone these services are available year-round. What other holiday-themed marketing campaigns do you love this year?